The home mortgage interest deduction is seen as a sacred cow in our tax code. Proponents insist that to get rid of it would substantially reduce home purchases and put downward pressure on prices. Who are the major proponents of this $70 billion a year tax expenditure? Realtors, Builders, and Banks. The exact people who profit the most when prices are inflated and loans are “easier” to get. The home mortgage interest deduction encourages borrowing, the benefits go largely to high earners, and the banks benefit the most. Why do we insist that downward pressure on housing costs is bad? We don’t mind when the prices of groceries, or gas, or cars, or appliances goes down, so why houses? Is it because of the way we treat housing in this country? Americans spend on average nearly 30% of their income on housing, move on average every 6 years, finance homes with 30 year mortgages with little money down (which can’t happen without government interference in the marketplace) and buy houses with high square footage per inhabitant. When all of these situations are lumped together we need housing prices to increase because we build little equity during the time we do own the houses and we put an inordinate amount of our wealth and income into our homes. Without changing our culture of how we handle home ownership, it is unlikely that the home mortgage interest deduction will go away. So what does the tax deduction actually do? For every dollar spent on mortgage interest, a taxpayer can reduce their taxable income by 1 dollar. Since we have a graduated income tax, this benefits higher earners to a much lager degree than lower earners. 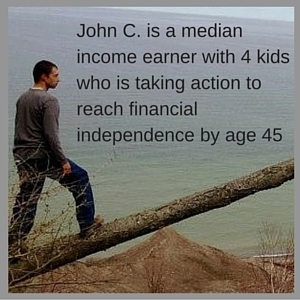 For a family in the 15% tax bracket, they will only gain 15 cents for every dollar in mortgage interest spent, while a family in the 33% bracket would gain 33 cents for every dollar spent. The deduction is more skewed to high earners as well because higher earners are more likely to purchase a more expensive house, thus borrowing more money and paying more in mortgage interest. Additionally, the deduction is only helpful if the taxpayer has enough total deductions to itemize instead of taking a standard deduction. The most popular itemized deductions in addition to the home mortgage interest deduction are state income taxes, property taxes, and charitable givings, because of this lower to moderate income taxpayers are less likely to have enough total deductions to offset the standard deduction, giving them no benefit from the home mortgage deduction. 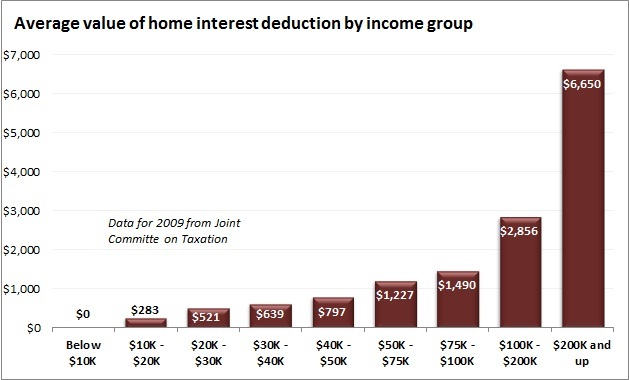 This explains why over 77 percent of the home mortgage interest deduction goes to taxpayers with incomes over $100,000. My biggest problem is that it encourages home owners to keep debt on their homes forever. Banks love to use the mortgage interest deduction as a selling point. “Well, it says your rate is 4% but with the mortgage interest tax deduction, its more like 3%.” The lenders job is to get you, the buyer, to spend as much money as possible on a home, while putting the least amount down. The interest expense on a $200,000 mortgage at 4% interest would be $8,000. For someone in the 25% bracket who already has enough deductions to itemize, this could result in a $2,000 reduction of federal taxes. Since this taxpayer has an extra $2,000 a year or $166 per month, He will be encouraged to spend it on getting a more expensive loan. Because of the deduction he could stretch and get a loan of $235,000 with this money. The lender and the Realtor, the two people giving advise to buyers benefit the most from this. The lender just received $1,400 more per year and the Realtor got an extra $2,450 in commission. Sure the borrower ends up with a marginally nicer house, but he also added $35,000 in debt! What can you do? For starters don’t buy into the hype that the mortgage interest deduction is necessary for a healthy housing market. Understand that the real benefits go to high earners and to banks, not to average taxpayers purchasing modest homes. When you do go to buy a house, don’t think and act like an American. While the number one rule of economics is that people respond to incentives, it doesn’t mean that we have to be driven by short term incentives without thinking about the long term consequences. Is a $2,000 a year tax credit worth having $200,000 in debt over? Put 20% down, get a 15 or 20 year fixed rate mortgage with a payment that can be covered by one weeks check, and don’t let the bank, or the Realtor sell you on buying a more expensive house. The number the bank gives you is the max you are approved to buy, not the price you have to pay. Don’t share this number with a Realtor, because he will only show you homes that are right around that max number. Don’t make long term decisions such as a home purchase based on a tax credit that could go away. Holding onto a mortgage for a tax deduction is insane. I urge all of my readers to join me in my goal to pay off my house early. Check out the House Payment Spreadsheet I made to track my progress while paying off my mortgage. We as a nation have longed lived above our means, while this is demonstrated the most in our expenditures for our federal government, our houses are directly behind it. A step towards changing this would be to cut the home mortgage deduction. This would save $70 billion a year on the deficit (currently over 10% of the 2013 deficit) and would remove a strong incentive for Americans to increase debt.